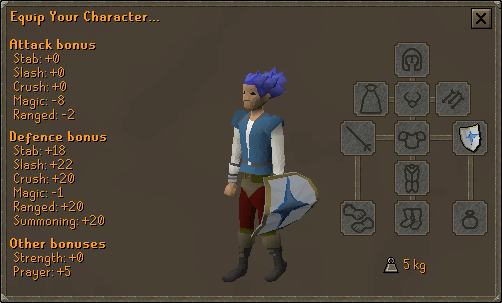 Redbeard Frank in Port Sarim, the Chemist in Rimmington or the Squire in the White Knights' Castle. Quests: A Fairy Tale Part II: Cure a Queen (started), Black Knights' Fortress, Garden of Tranquillity, Hand in the Sand, Mogres, Recruitment Drive, Rune Mysteries, Slug Menace, The Knight's Sword, The Rat Catchers, Wanted! 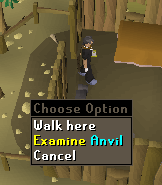 To begin the Falador Tasks, speak to either Redbeard Frank in Port Sarim, the Chemist in Rimmington or the Squire in the White Knights' Castle in any members world. 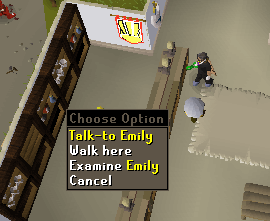 You will know when you have finished a task, as a message will appear in your chatbox, similar to this one. It's worth noting that the easy tasks must be complete before the others can be finished, although it's not necessary to complete the easy tasks to begin the others. The order of these tasks are not the same as the in-game ones, as this order is the fastest method for doing all the tasks at once. 1. 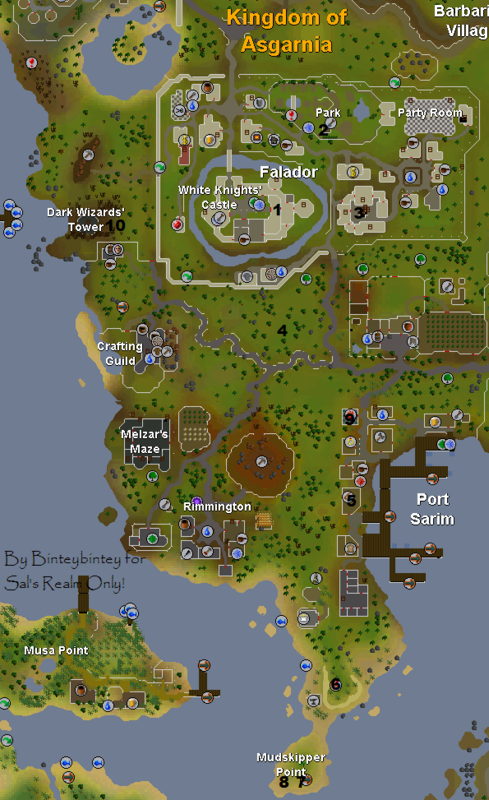 From Central Falador, head South-West into the bar, and purchase any drink from a barmaid, behind the bar. 2. 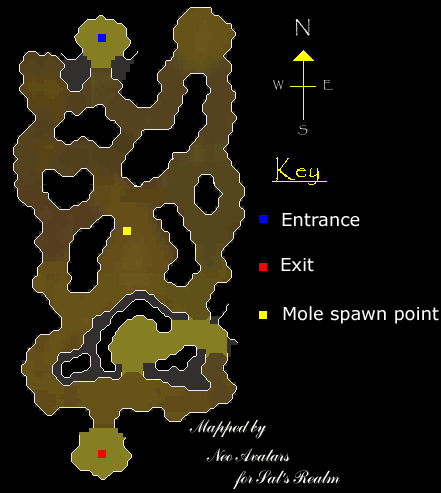 Head North East into Falador Park and kill a Duck (Level 1) with either range or mage. 3. Now use your spade on a mole hill to enter the tunnels. Make sure you have a rope, a light source and a tinder box. To get out, follow the map below, or you can teleport. If you chose to teleport out, run all the way round to the very bottom of the city, below the moat, and enter the armor shop, if you followed the tunnels, you will come out by the chainbody shop. 4. 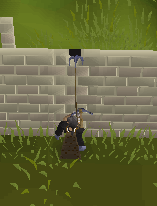 Head West from the exit of the well to the chainbody shop and purchase and wear, a black chainbody for 1440gp. 5. 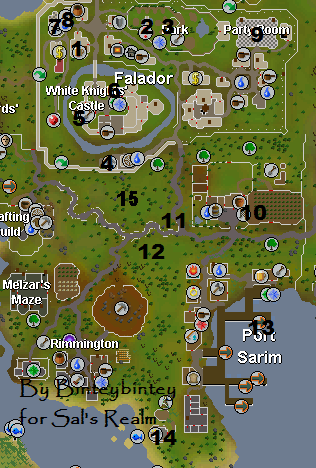 Head back north to Central Falador, and the follow the path south and into the Courtyard of the Castle. Climb the staircase to the west, and keep going up the first staircases available to you. 6. Now go down all the staircases again until you reach the courtyard. 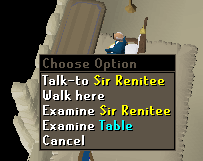 Climb the staircase to the East and then head West until you reach Sir Renitee. Talk to him to learn of your crest. Continue back down the way you came. 7. 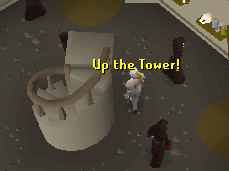 Head North to reach Central Falador, before heading west into the hairdressers. Use some cheese with the treadmill to feed the pet. 8. Head a few squares North of the Hairdressers door, and use a bucket on the pump. 9. 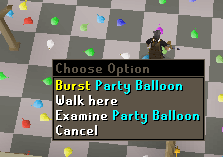 Head to the North East of Falador, and talk to Party Pete inside the Party Room. 10. 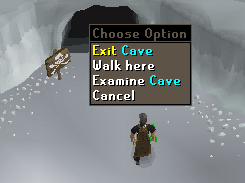 Now leave Falador via the Southern exit. After leaving the City boundaries, immediately head East to a field full of Cows. Head south through there, and continue South until you reach some housing. 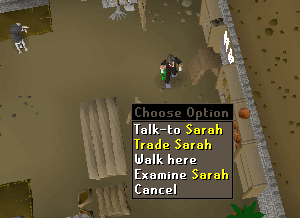 In the house, trade with Sarah and buy an Amulet of Farming(8) for 200gp. 11. Then go south of the housing, and head West. When you reach the T-junction, wander around that area to find a highway man (Level 5). Kill him. 14. After sailing back to the main land, head South West to recharge your prayer, a little West of Port Sarim Jail. 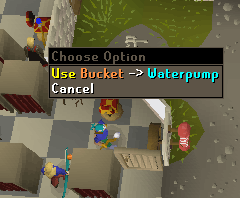 You must be at least 1 prayer point down for this to work. 15. 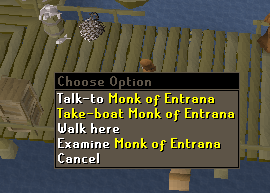 Now head to the Mind Altar located north of Falador and east of Goblin Village. 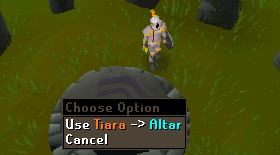 Craft a Mind Tiara by using it on the stone inside (with a Tiara in you inventory) and head back to Redbeard Frank to complete the easy tasks. 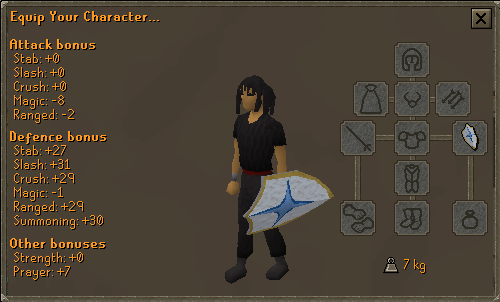 Falador Shield 1 - This restores prayer by 25% (can only be used once a day) and has a +3 prayer bonus. 1000xp Reward Lamp for any skill above 30. A special emote (See Bottom). Quests: Black Knights' Fortress, Garden of Tranquillity, Recruitment Drive, The Knight's Sword, The Rat Catchers, Wanted! The order of these tasks are not the same as the in game ones, as this order is the fastest method for doing all the tasks at once. 1. 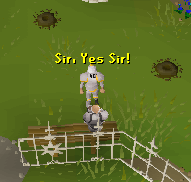 From the Centre of Falador, head East into the park, and salute (using the emote) Sir Tiffy whilst wearing full initiate armor. 2. 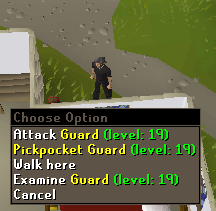 Now head down to the Southern Gate and pickpocket a guard. 3. Go South down through the gates and immediately head East until you reach an enclosed area full of cows. Enter the area, and continue South to some housing. Enter the house and continue to the Southern Room to weave your basket using 6 willow branches: these can be obtained from cutting player-farmed willow trees with secateurs. 4. Head North again and cross the style to the East in the cow area. Plant a Scarecrow in the central flower patch, with some sweetcorn growing in the nearby patch. This may have to put in and out several time. To make a Scarecrow, use an empty sack with a haystack (the sack can be bought from the lady selling Amulets of Farming - Sarah - and the hay can be found in the pen to the West, simply go through the house, through the kitchen and out into the pen) and then a bronze spear with that (note, it has to be bronze, else your character will complain that it's a waste) and a watermelon on top of that. 5. 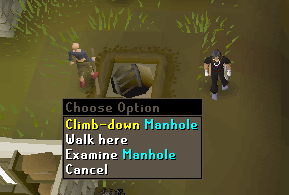 Move South through the cabbage field to Port Sarim, and then climb down the manhole to enter the rat pits. 6. Go to the docks, and around the middle of the main horizontal dock (in between the fishing and food shop), will be a crew to take you to Musa Point. Talk to them, and use your charm (from the Ring of Charos(a)) to get there and back from free. 7. Now continue South to the exclamation mark and go down the ladder, follow the paths, and mine some blurite ore. Kill an Ice Giant and then come back up. 9. Head North West to Rimmington, and inside the Chemist's House (Furthest one to the West, below the farming patch), light a bullseye lantern. You need oil for this, so just follow his instructions on what to do. 10. Head straight North to the agility shortcut underneath Faladors South Wall, crawl under it. 11. Continue heading North through the gates, following the path to the North East, Once your reach a little further East of the Quest Symbol, head North as if you were going to the monastery. At the Monastery entrance, go West to the bottom of Ice Mountain, and then North to the fortress. It may be easier to use the Glory Amulet's Edveville Teleport for this. When you are there, kill a knight inside. To get in you need to be wearing a bronze medium helm and an iron chainbody. 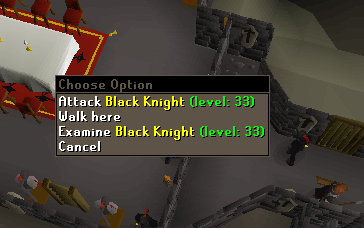 You can, however, kill any black knight, so you may prefer to kill the one near Draynor. 12. 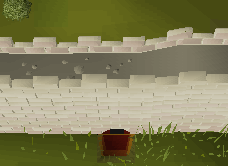 Now head south to grapple over Falador's North Wall to complete the task. Congratulations! You've completed the medium level tasks! Falador Shield 2 - This restores your prayer by 50% when clicked on (can only be used once a day) and gives a +5 Prayer Bonus. 5000xp Reward Lamp for any skill above 30. 1. 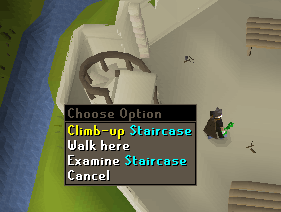 From Central Falador, head South into the castle courtyard, and take the flight of stairs to the East. On the first floor, head West to Sir Renitee in a large armchair. 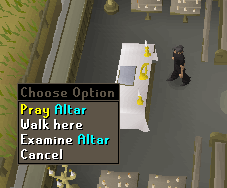 Speak to him and flick through the options until you can change your crest to Saradomin. 2. 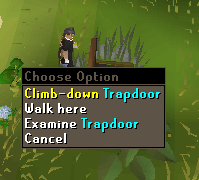 Go back down the stair case and North East into Falador Park. 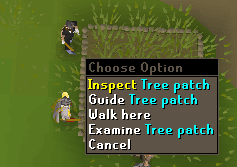 Grow either a Yew or a Magic Tree (the Assist System can be used here, as it requires a high farming level). 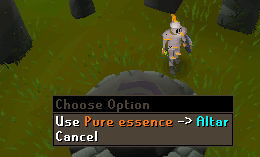 As you leave the park, go via the bank to get your 28 pure essence. 3. 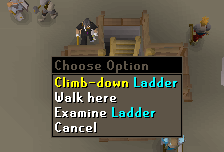 Leave the park and go to the mining guild, climb down the ladder and back up again. 4. Head out of the South Gates and go South West to the air altar. Craft the runes, and bank them, as to have enough room for the summoning pouch etc. 5. 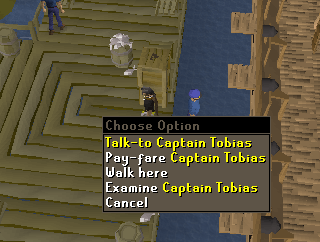 Go to Port Sarim, and continue South until you reach the Fishing store, summon your Ibis in there. 6. Leave the shop, and go down to the exclamation mark where the blurite ore is found. Warning: The next section requires you to fight an aggressive level 140. Head to the South of the icy part of the caves, and go into the dark hole. Kill a Skeletal Wyvern inside. To kill one of these deadly creatures, you should have either an Elemental shield, a Mind shield or a Dragonfire Shield as without one, they can hit up to 500 and drain your stats! They prove more Defenceless with slash attacks, so a melee weapon is recommended. They have very strong Magic Defence. 7. After leaving the caves, run South to the fairy ring. Teleport to Zanaris, and then back to the fairy ring with the code; AIQ. 8. Now kill one of the Mogres (Level 60) before heading back up to the rune shop in Port Sarim. 9. In the rune shop, speak to Betty to purchase some Pink Dye, and use it on any cape (this can be obtained from a nearby highway man). 10. 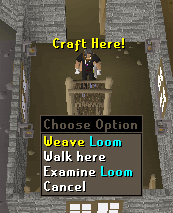 Head North West to the Crafting Guild, and continue North, through the gate until you reach the Dark Wizards' Tower. Now head back to the park, and wait until your tree is ready to be cut down, before completing the tasks. Congratulations! You've completed all the hard tasks! Falador Shield 3 - This restores your prayer by 100% (can only be used once a day) and gives a +7 prayer bonus. 10000xp Reward Lamp for any skill above 30. Lily Seeds - These can be redeemed from Wyson, when planted, they protect all crops near-by. Note: If you have the Coin crest when changing to the Saradomin crest, you will be given a Voucher as a reward so will not be required to pay again if you wish to change your crest back afterwards. 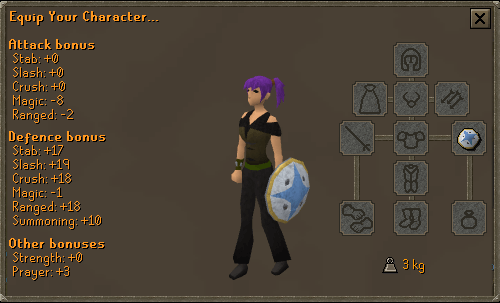 To use any of the features of the shield, right click "operate" on it.